My Sweet Prairie Studio / Art by Monika Kinner-Whalen: New Work & Mark Your Calendars! New Work & Mark Your Calendars! Early March was a whirlwind indeed. I sold a whole pile of art suddenly at Handmade House and so I had to really get to work for my vendor booth at the SMQG Showcase. Fifteen new 'minis' were made and most were framed and sold. Here they are prior to framing. They are small, original, dreamed up, and packed with prairie, each with their own unique details. They get framed under glass in 3" wood framed. I want to show you these too! I made up some more of my mixed media bird embroideries with a different selection photos. These are the friendly little birds I photographed at Beaver Creek, the same images I use in the threadpainting classes I teach. These are free-machine embellished photos. 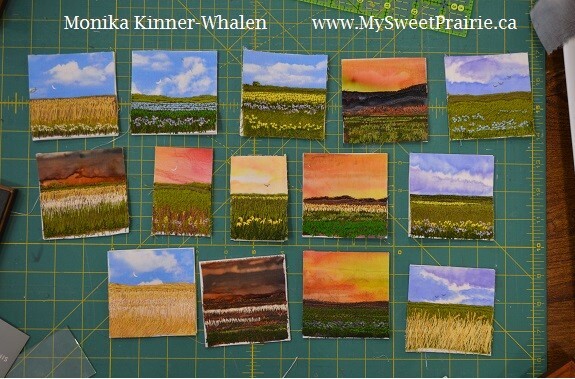 They are something I can make several times over, and so I sell them at half the price of my original prairie threadpaintings. I really love these two photos. It is of the same bird, but as a pair, they make a great set. I LOVE them in white; it's so clean and so fresh. 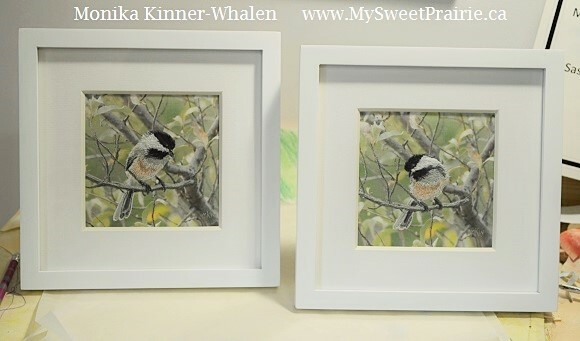 I have different chickadees available at the MacKenzie Gallery in Regina. I've also dome some thread embellished photos of deer in winter that I captured out at Cranberry Flats. I like doing animal art this way. The fur and feathers are just so perfect for threadwork. Keep watch - I'll likely have some more at Gardenscape in early April. You may be able to find them at Handmade House on my shelf, but they don't last very long! Here's my favourite from last weekend's sale. It was sold and gone before I could even admire it. 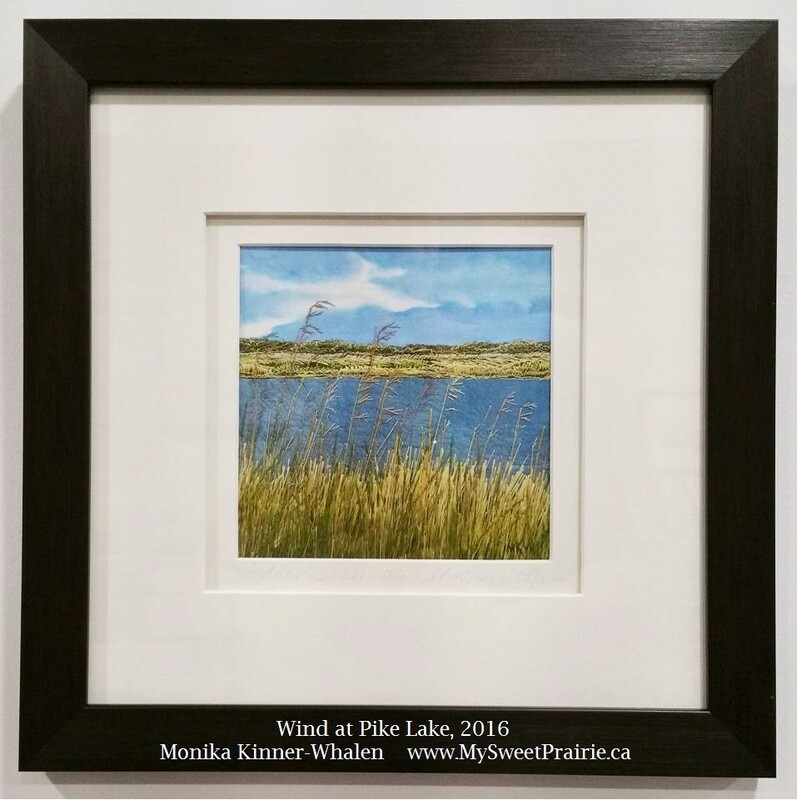 It's called, 'Wind at Pike Lake'. Whenever we go, we sit off to the side of the beach where the grasses are high and the kids find frogs. The dyed fabric here was really great for the water on a windy day. There aren't whitecaps, but you can see the water in endless rough ripples. Lots of beautiful work, Monika! Thanks for sharing it with us. Thanks for sharing, but I had thought you weren't posting here lately since your new site? BTW its awesome that busy is the word girl! Hey, your lovely postcard just arrived, sweet thank you for this gorgeous example!